Habit: Shrub; generally dioecious; taproot deep. Stem: erect, prostrate, occasionally climbing, jointed, much branched, green in youth; branchlets opposite or whorled, cylindric, longitudinally grooved; pith brown or white. Leaf: simple, 2 (each pair at right angles to adjacent pairs) or 3 per node, scale-like, +- fused at base into membranous sheath, generally ephemeral; resin canals 0. Cone: axillary (terminal), sessile or not, 1--many per node, ovoid or ellipsoid. Pollen Cone: bracts 2--3 per node, proximal sterile, distal subtending 2 basally fused bractlets subtending a stalk with 2--10(15) sessile to stalked, anther-like parts with 2 apical pores. Seed Cone: stalk 1--11(50) mm, generally straight, naked or with reduced basal bracts; distal bracts in (2)4--10 pairs or whorls, free or fused, brown or green, scarious or fleshy, subtending 2 fused leathery bractlets enclosing 1 ovule. Seed: 1--3(4) per cone (in ×-section, +- round if 1, +- semicircular if 2, +- triangular if 3, etc. ), +- spheric to ellipsoid or lance-ovoid, beaked or not. Genera In Family: 1 genus, +- 50 species: arid, semi-arid (to tropical) regions of northern Africa, Asia, Europe, North America, South America. Stem: spreading to generally erect, 0.3--2(4.5) m; uppermost bud generally conic, generally not thorn-like. Stem: 0.3--2 m; twig +- green, aging yellow, glaucous or not; pith dark brown. Leaf: 2 per node, 1--3.5 mm, generally persistent; sheath splitting, base in age swollen. Pollen Cone: 1--many per node, 2.5--7 mm; bracts 2 per node. 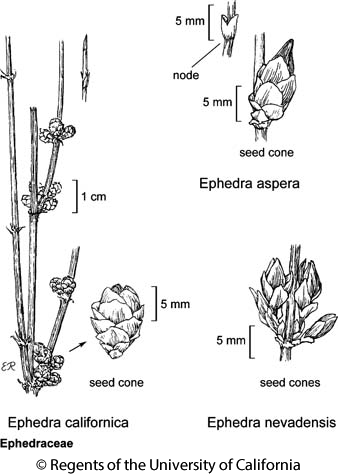 Seed Cone: 1--few per node, 4.5--8(10) mm, ovoid, stalk <= 2 mm, basal bracts reduced; distal bracts 2 per node, free, ovate, red-brown, margins membranous, stalk-like base 0. Seed: generally 1, 4--7(8) mm, generally < 2 × as long as wide, smooth to +- roughened. Chromosomes: 2n=14,28. Ecology: Creosote-bush scrub, Joshua-tree woodland; Elevation: 50--2133 m. Bioregional Distribution: SnBr, SnJt, SNE, D; Distribution Outside California: to Texas, Mexico. Note: Cones present Mar--Apr. Citation for this treatment: Stefanie M. Ickert-Bond 2012, Ephedra aspera, in Jepson Flora Project (eds.) Jepson eFlora, http://ucjeps.berkeley.edu/eflora/eflora_display.php?tid=24282, accessed on April 21, 2019. No expert verified images found for Ephedra aspera. SnBr, SnJt, SNE, D; Markers link to CCH specimen records. Yellow markers indicate records that may provide evidence for eFlora range revision or may have georeferencing or identification issues. Purple markers indicate specimens collected from a garden, greenhouse, or other non-wild location.